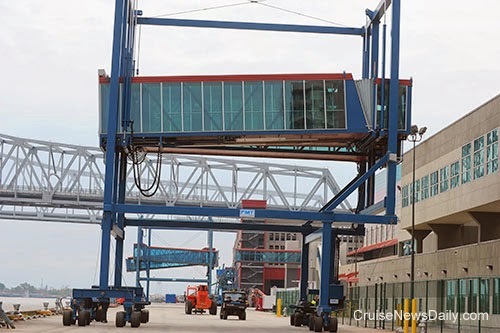 The $2.3 million renovation and expansion project of New Orleans’ Erato Street Cruise Terminal to accommodate Carnival Dream is on track for completion by the time the ship arrives there on April 13. This week Disney released next year’s summer programs for their two smaller, seasonal ships. They’ll be going a couple of familiar places and also to an area completely new for Disney. of the $2.3 million remodeling of the Erato Street terminal. Ailing passengers have kept the US Coast Guard busy this week with air medevacs from cruise ships along the US east coast. They have all been fairly routine operations for the Coast Guard, but some very good video was provided of one. In this case it was a medevac of a 35-year-old man from Norwegian Gem as the ship sailed 180 miles off the coast of Nags Head, NC on Tuesday. The Coast Guard dispatched both an MH-60 Jayhawk helicopter and an HC-130 Hercules fixed wing aircraft, and they included video shot from the Hercules of the Jayhawk helicopter maneuvering over Norwegian Gem. The video shot from the helicopter is looking straight down on the pool deck as the patient is lifted from the deck of the cruise ship, assisted by the rescue swimmer. It’s all fairly routine for the Coast Guard, until the patient gets to the door of the helicopter and there seems to be a little problem getting the stretcher in the door. In the end, the Coast Guard completes the mission, and patient is delivered safely to the Coast Guard station at Elizabeth City where an EMS team took him to a local hospital. Next month Carnival Freedom will enter drydock to receive all the Fun Ship 2.0 enhancements it can hold along with the upgrades necessary for the complete Seuss at Sea program. Green eggs and ham are so close you can smell them! The work will be done at the Grand Bahama Shipyard in Freeport from April 19 to May 3. Royal Caribbean made two little changes the other day that went under most people’s radar. They won’t cost you money, and actually may save you some, but they are important to be aware of. The changes apply to all three RCCL brands: Royal Caribbean International, Celebrity Cruises and Azamara Club Cruises. 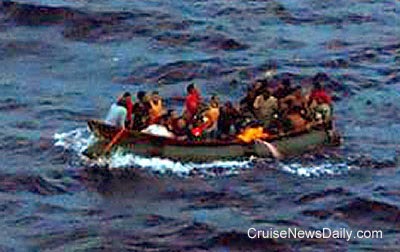 Carnival Ecstasy quite possibly may have saved 41 lives in the Florida Straits on Tuesday night. The bridge spotted a small unseaworthy boat that was grossly overloaded with 41 Cuban nationals that was taking on water. The Carnival captain altered Ecstasy’s course to render assistance, and took the 41 people aboard. It was found that the boat had no life saving or navigation equipment aboard. and was taking on water. Royal Caribbean International this evening revealed their dining concept, called “Dynamic Dining,” for the Quantum-class ships. Monday we reported that Royal Caribbean had delayed Adventure of the Seas’ departure from San Juan by a day while the propeller blades were removed from the non-working propulsion pod so the ship could sail more efficiently. The delay meant dropping Barbados from the itinerary. Unfortunately, removing the blades proved more difficult than anticipated, and it took divers until today (Wednesday) to complete the job, so Adventure didn’t depart San Juan until 11am today. CND subscribers also read about second thoughts lead to a cruise ... and Virgin ready to move forward. Silversea added a third expedition ship to their fleet today. It was officially named Silver Discoverer in Singapore by Elda Turco Bulgherini, professor of navigation law at the University of Rome Tor Vergata. Silver Discoverer isn’t a newbuild copy of Silversea’s other expedition ships. It’s the former Clipper Odyssey, freshly back from a refit that made it into what Silversea passengers expect. The Coast Guard opened the Houston Ship Channel on a controlled basis, and three of the four cruise ships that had been trapped in their turnaround ports left as soon as they could. Royal Caribbean’s Navigator of the Seas, having removed the indecision yesterday and canceled this week’s sailing, remained in Galveston with customers aboard enjoying the ship at the pier. CND subscribers also read about a crew member arrested in Palm Beach ... lower demand in Japan ... and more trouble in Japan. SEATTLE, March 25, 2014 - Seabourn announced that it has hired veteran expedition leader Robin West as its Manager, Expedition Operations & Planning, to head up its cruise programs in Patagonia and the Antarctic, as well as developing new expedition land elements and tours for the company in other regions around the world. The appointment follows West's role as expedition leader during Seabourn's highly successful inaugural season of four voyages aboard its ultra-luxury Seabourn Quest in Antarctica and Patagonia between November of 2013 and February of 2014. A native of South Africa, West is a graduate of the University of Port Elizabeth. After graduating he founded two companies offering scuba diving and outdoor adventure experiences in many of South Africa's most beautiful and exciting areas. Expanding his experiences beyond Africa, he has participated in expedition travel operations since 2002, sailing on numerous ships and planning and executing expedition programs for half a dozen companies. He has spent multiple seasons in regions from the circumpolar Arctic to the Antarctic, including East and West Africa, the South Pacific, Indian Ocean, Southeast Asia, Central and South America, Australia and the Mediterranean. At Seabourn, West will be responsible for planning and managing Seabourn's cruises in the Patagonia and Antarctic regions and will continue his role as onboard expedition leader during the company's Antarctica season. He will also act on the company's behalf in preparing the detailed daily landing schedules in Antarctica and hiring and managing the larger expedition team. In addition, he will further enhance the company's current deployments with added opportunities for Seabourn guests to enjoy the company's award-winning, six-star luxury and onboard amenities in combination with authentic, adventurous experiences ashore. Early Saturday afternoon a bulk cargo ship struck an oil barge near the intersection of the Texas City and Houston ship channels spilling as much as 168,000 gallons of heavy fuel oil, according to the Coast Guard. That brought cruise ship traffic to and from Galveston and Houston to a halt. It left Carnival Miracle and Navigator of the Seas on their way to port with no way to get in on Sunday morning, and Caribbean Princess in Houston with no way to get out Saturday evening. Adding to the pressure, Carnival Triumph would be arriving Monday morning, but the delays would never last that long, would they? Last week when Adventure of the Seas had a propulsion problem and had to alter its itinerary, Royal Caribbean said modification to this week’s itinerary (a different one) wouldn’t be necessary, and the ship was going into dry dock next week where the problem could be fully repaired. Yesterday when passengers were arriving at the ship for Sunday’s sailing, they heard that the plan had changed.